Easter- one of the most egg-cellent holidays- is on Sunday April 16. Restaurants across Connecticut are creating special Easter menus, from the traditional to the more festive. Be sure to make your reservations soon so that you can celebrate with some-bunny special. Redding Roadhouse, Redding, will host an Easter buffet with a cold station, cheese and charcuterie display, pastries, an omelet station, waffle bar, hot buffet, and more. There will even be appearances by the Easter bunny. Norwich Inn, Norwich, presents an Easter brunch from 11am-3pm. The spread features pastries, an omelet station, a raw bar, carving station, dessert, kids' options, and more. Present Company, Simsbury, will serve Easter brunch starting at 10:30am. L’escale, Greenwich: L'escale's Easter brunch will include a raw bar, country table, an omelet station, a breakfast station, desserts, and more. Join them from 11am-4pm. Bernard’s, Ridgefield will serve Easter brunch and dinner on Sunday April 16. Brunch runs from 11-12:30pm while dinner runs from 1:30-6pm. Shell & Bones, New Haven will be offering a special all day Easter menu, with highlights including Octopus La Plancha, Fried Oysters and Maple Bacon Pan Roasted Scottish Salmon, Romesco Potatoes, and more. Fresh Salt at Saybrook Point, Old Saybrook Easter Sunday Brunch will feature entrees like Blackened Atlantic Salmon and Pork Tenderloin as well as traditional breakfast items like eggs, croissants, and waffles. IRONS at Hilton Mystic, Mystic: Enjoy brunch from 11am-3pm and take photos with the Easter bunny as part of the festivities. Outriggers, Stratford, has prepared a special Easter menu. There children's options for kids 12 and under. St. Clement’s Castle & Marina, Portland, will have two seatings for easter brunch: 11am and 1:30pm. The extensive buffet costs $39.95 per adult, $16.95 per child ages 4-12, and is free for children under 4. David Burke Prime, Foxwoods Casino, invites you to Easter brunch and dinner. Try their 100-day Dry Aged Cowboy Ribeye, Bourbon Glazed Pork Porterhouse, and more. The Cottage, Westport will offer an Easter meal from 11am-7pm. It costs $45 for adults and there is an a la carte menu for children. Artisan, Fairfield, prix fixe Easter menu is $59 for adults and $39 for young adults. It includes an amuse, appetizer, entree, and dessert. Vue 24, Foxwoods, will offer a brunch consisting of a choice of Plats Premières and Plats Principal with Assorted Breakfast Breads, Creamery Butter, Housemade Preserves, and a Grand Dessert Buffet . Millwright’s, Simsbury: Make a reservation at Millwrights in Simsbury for a 3 course prix fixe Easter meal. It costs $59 for adults and $29 for children under 12. Match, South Norwalk, is hosting an Easter Brunch complete with Organic Chicken & Fried Waffles, Brioche French Toast (with Foie add on) and Lamb T-Bones. J House Restaurant, Greenwich: J House's Executive Chef Conor Horton has created a special Easter Brunch menu. Join them between 11am and 4pm. Spinning Wheel, Redding, will serve an extensive buffet that costs $42.95 for adults and $24.95 for children ages 5-10. Join them on Sunday April 16 from 10am-4pm. BALLO Italian Restaurant, located in Mohegan Sun, will feature a 14oz spring braised lamb shank with English pea risotto, pea shoots and gremolata for $44 per person. Cafe on the Green, Danbury invites you to a five course Easter meal on Sunday April 16. Partake in dishes like Roasted Leg of Lamb and Grilled Salmon Siciliano. 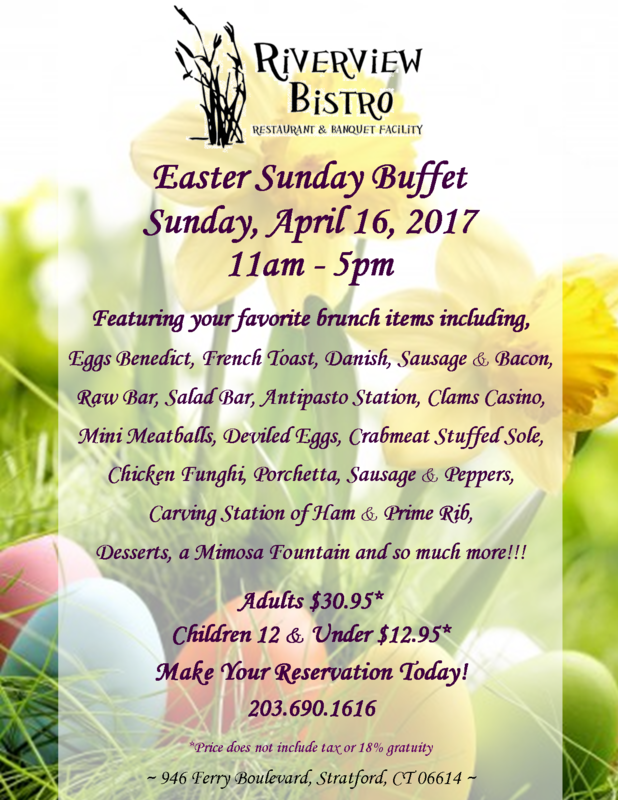 Long Ridge Tavern, Stamford, will have a special Easter Brunch on Sunday April 16. Dinner will then resume from 5:30-7:30pm with the Regular Menu a la Carte. Harbor Lights, Norwalk offers their special prix fixe Easter Sunday menu includes a choice of starter, entree, and dessert. It costs $49 per person, plus tax and tip. Rive Bistro, Westport, has a special Easter menu with dishes like Steak Frites, Pork Tenderloin, Grilled Lamb Chops, and Lobster Bisque. Save room for dessert, too! Capital Grille, Hartford, Stamford: Join The Capital Grille for an Easter Brunch including unlimited mimosas and a three course menu. Gingerman, Greenwich: Visit the Ginger Man on April 16 for specials like North Country Maple Glazed Ham, Pan Roasted Halibut, and Angus Beef Roast Prime Rib Au Jus. Hash House A Go Go, Mohegan Sun, will have both an Easter brunch and dinner. Brunch will be served until 5pm and dinner will go from 5pm until close. Riverview Bistro, Stratford, will serve a traditional Easter Sunday Buffet from 11am-5pm. From eggs benedict to prime rib, traditional favorites are all on the menu. Todd English’s Tuscany, Mohegan Sun, will serve braised lamb shank, spring pea risotto, and heirloom radish with an arugula salad for $36.00. Hop on over with your family and friends and celebrate Easter at Cask Republic! All locations (New Haven, South Norwalk & Stamford) will be offering a special Easter menu in addition to their regular a la carte menu. All menus can be found on caskrepublic.com. The Chelsea, Fairfield has a special la carte menu (in addition to their regular menu). They will be serving up Bottomless Bloodies & Mimosas for $15.95.